Pattern Description: Pattern is like US Glass Sheraton pattern but without the Greek key border. 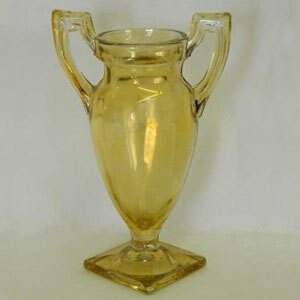 This 7″ high vase has flashed marigold iridescence and is shaped like a trophy with double handles. The base is diamond shaped. The pattern is similar to US Glass' Sheraton pattern but doesn't have the Greek Key pattern around the top edge.